Choosing roses can be easier than you think. You need to decide three things: Which types of roses you like, where they will grow, and how much time you want to devote to them. Then the fun begins! Questions to ask yourself include: What colors do you like, do your roses have to have a fragrance, and what you will use the roses for? Rose colors include white, pink, purple, red, orange, and yellow. Many start out dark and fade to lighter shades, some have colored stripes, and others are a mixture of colors. There are roses that have strong scents and others with no scent at all. Do you want roses for color in the garden, to grow on a structure, to cut for indoor arrangements, or for fragrance? Start by knowing your frost hardiness zone and sun requirements. Much of Buncombe County is classified USDA Zone 7 for frost hardiness. 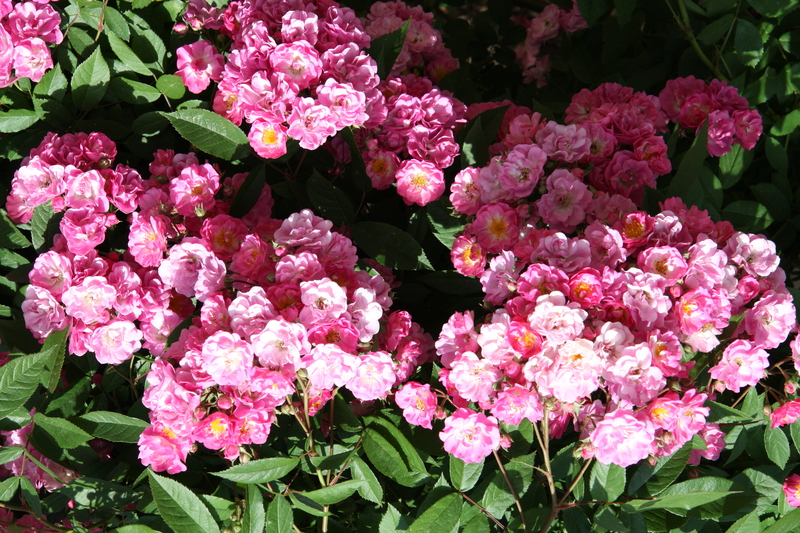 Most roses require 6 to 8 hours of sun, although some are more shade tolerant. How much space do you have? Some roses require large areas to grow, while others take up only a little space. Some roses will grow in containers. Decide how much time you have to care for your roses. Roses need an inch of water a week and as much as twice that in hotter months. They are heavy feeders, so perform best when fertilized during the growing season. Many suffer from pests and funguses, although some roses were developed to be disease resistant and need little spraying. Places to learn about roses include books, websites, rose societies, and the Cooperative Extension service, along with many reputable growers who offer information about the roses they sell. The American Rose Society has an easy-to-navigate website that offers answers to your rose queries at www.rose.org. The Asheville Blue Ridge Rose Society website is www.ashevillerosesociety.org. The Buncombe County Extension Master Gardener Volunteers can also answer questions about types of roses, suggest good varieties for our area, and offer planting and care instructions. Article written by Donna Sapp, Extension Master Gardener Volunteer. 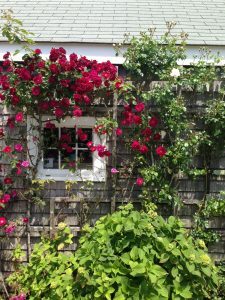 While European gardeners planted roses in beds with other plants and expected them to thrive without special attention, serious American rose gardeners focused on producing a few perfect flowers each season so they could win competitions. 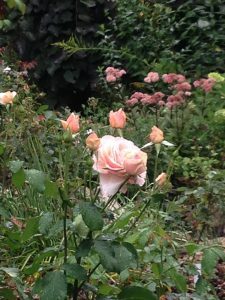 Fragrances, hardiness, and resistance to diseases such as black spot—a common fungal infection of roses—were cast aside for bigger, better-formed blooms. By the 1990s, American gardeners were no longer willing to take on these divas! For many of us, gardens were smaller and schedules busier. We had discovered organic gardening and pollinators and did not want to use toxic sprays. 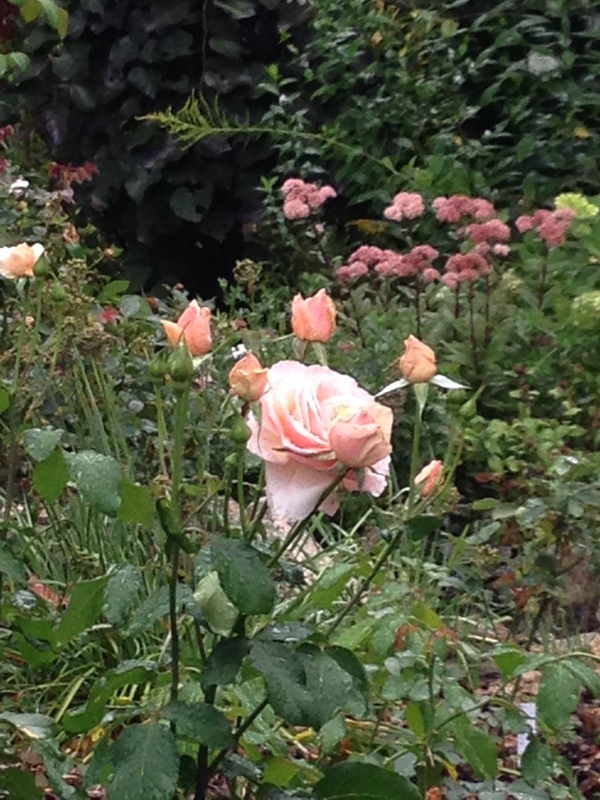 Then in the 1990s, David Austin roses reached the U.S. market, reintroducing easier-care garden roses with fragrance. In 2000, Knock Out® roses took the industry by storm. Their even easier care, long bloom season, and black-spot resistance appealed to yet more gardeners. Other rose hybridizers saw the huge market for disease-resistant roses, and began to create their own. Developing a new rose takes about ten years and a bit of luck. We are just now beginning to reap the benefits of the hybridizers’ efforts. American rose distributors have begun importing disease-resistant roses from Europe where there have been no-spray rose trials for years—many pesticides are banned in Europe. No-spray trials are now happening in the United States. ‘Sunshine Daydream’, a yellow grandiflora, was the first rose to win the All-America Rose Selection rose of the year under no-spray conditions. ‘Francis Meilland’, ‘Beverly’, and ‘Savannah’—all fragrant hybrid teas—have won awards in the Biltmore (no-spray) International Rose Trials here in Asheville. To learn more about roses, contact your local rose society. The Asheville Blue Ridge Rose Society serves Western North Carolina. Visit their website at www.ashevillerosesociety.org or contact them by email at rosesocietywnc@gmail.com. 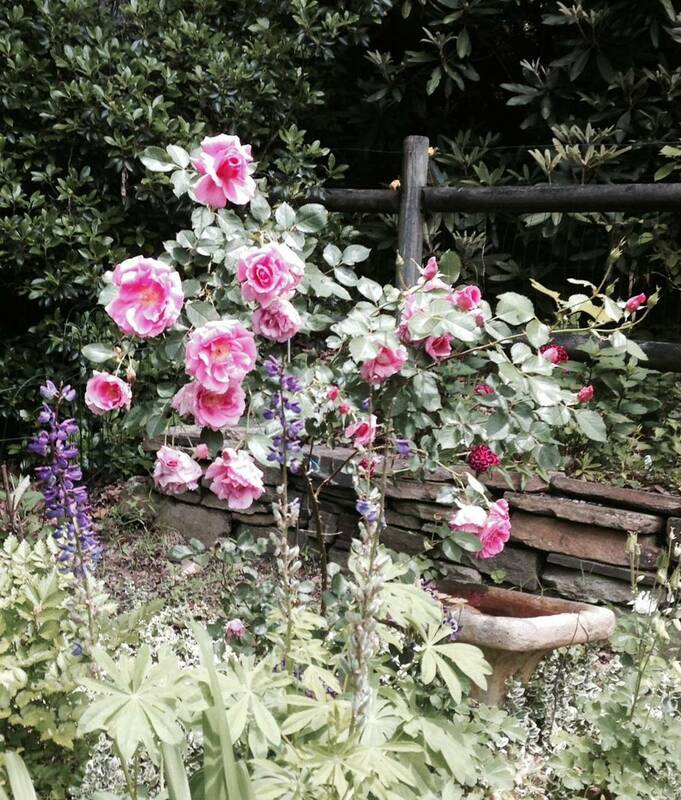 The Buncombe County Extension Master Gardener Volunteers’ “Gardening in the Mountains” lecture series will present a talk on rose care and disease resistant roses at the County Extension office, 49 Mt. Carmel Rd., on Thursday, July 21, 11:30 to 1. Call 828-255-5522 to reserve a seat. Article written by Judy Deutsch, Extension Master Gardener Volunteer. There is nothing more romantic than living in a rose-covered cottage or walking under an arbor or pergola covered in fragrant roses. 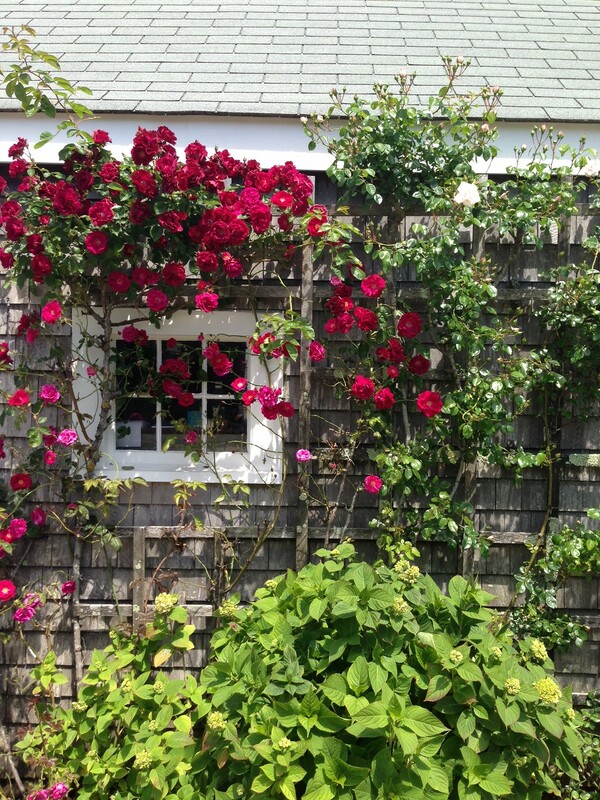 Climbing roses can add a colorful vertical accent to almost any garden. 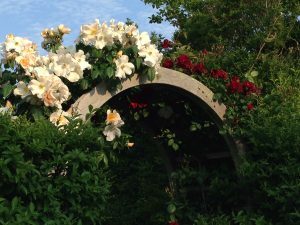 Climbing roses need a sturdy structure—an arbor, pillar, pergola, or lattice—on which to grow. Make sure your structure can support the weight of your climber. Although some climbers stop growing at 10 or 12 feet, others can reach 30 feet or more in height. Unlike beans or peas, roses will not voluntarily climb a structure, so it is up to you to get them onto the structure. It is remarkably frustrating to have a beautiful arbor but a rose happily growing in exactly the wrong direction! Site your rose carefully. Like all roses, climbing roses want full sun. Once trained on a structure, your rose will not be as easily moved as a non-climbing rose that you can simply dig up and relocate. Plant your rose 12 inches or more from the structure, not right up against it. Note that if you are planting up against a house or shed, overhanging eaves may reduce the amount of rain water that hits the ground and you will need supplemental water. Climbing rose leader canes with lateral growth trained on fence. Climbing roses have two types of canes—leaders and laterals. Leaders are the long canes that come out of the ground and are usually the ones you attach to your structure. Lateral canes come off of lead canes and produce flowers. The more parallel to the ground your lead canes, the more laterals they will produce, and the more blooms you will have. A climber growing straight up an arbor will only have blooms at the top. Therefore, you want to train the lead canes to grow parallel to the ground on a supporting structure. It is much easier to train a climber on an arbor, pergola, or lattice structure than on a column or pillar. If you want to wrap your climber around a pole, wrap the lead canes as parallel to the ground as possible. Young canes are the most supple and amenable to bending or shaping. 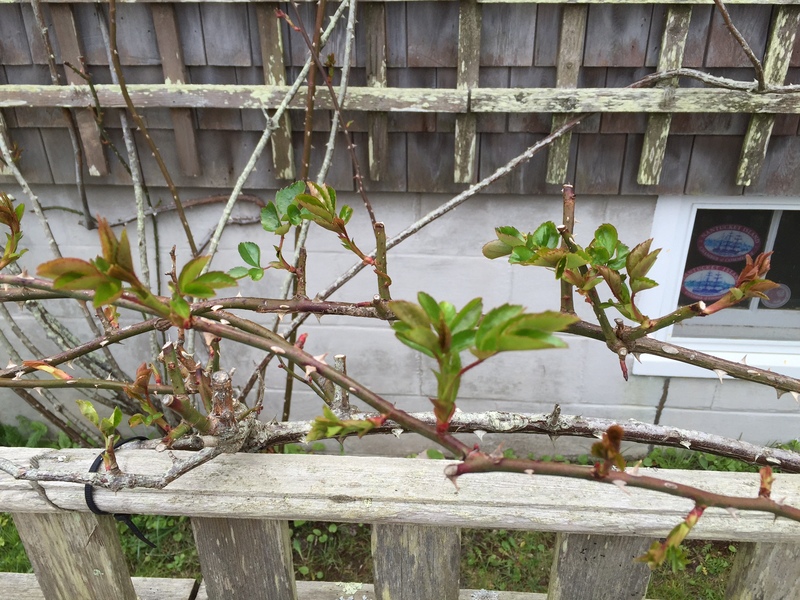 Plan on tying up your climber several times during the growing season so you can work with new growth. Twine and string are good choices for tying canes. They are softer than wire, which can cut or damage the canes. 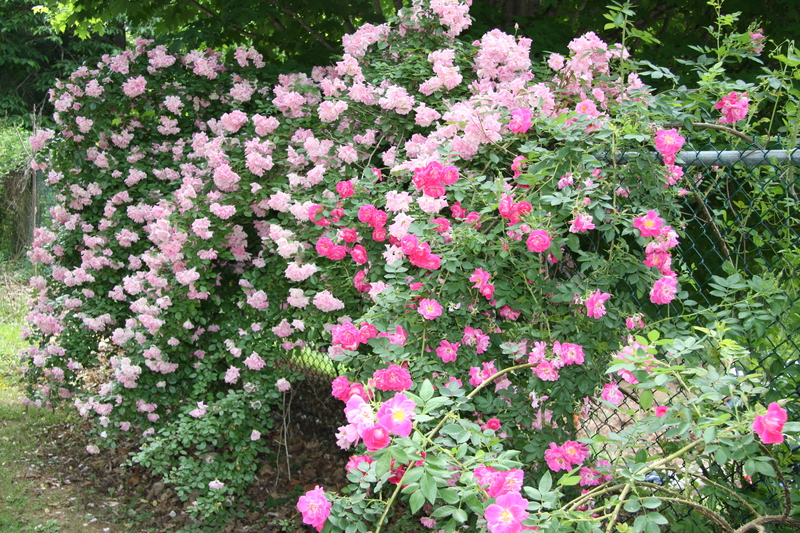 The care of climbing roses is similar to that of their non-climbing brethren. They need the same fertilizing and watering regimen. They are susceptible to the same diseases. 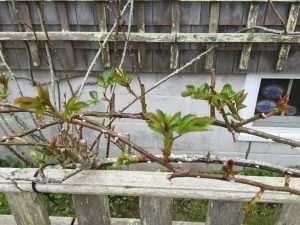 However, pruning climbing roses is different. Remove dead, damaged, or diseased canes, but let the healthy lead canes grow long to suit both your taste and your structure. You should also prune back the laterals to keep them in check and to promote re-blooming. To learn more about pruning climbing roses, contact your local rose society. 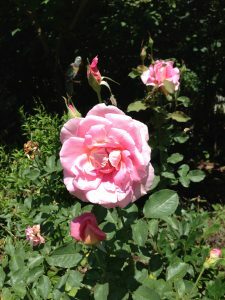 The Asheville Blue Ridge Rose Society serves Western North Carolina. Visit their website at www.ashevillerosesociety.org or contact them by email at rosesocietywnc@gmail.com .